Morning came very early today! We were all up and moving at 0500 which is WAY too early for most of us. Dan is the early bird in this flock. But we had to do it in order to get to the ferry dock in time. We have a pretty tight schedule today so there’s no time to dilly dally. We have coffee and tea and everyone slowly starts to get going. Of course we’ve got to load the car with all of our food and luggage so Dan takes the lead and starts hauling out the goods. After a quick walk through to be sure everything is left the way it’s supposed to be and to be sure we haven’t left anything behind, we are off to the races again. The sun is barely peeking over the horizon as we head down the mountain toward town. We make a few wrong turns and for the first time since we’ve been on this trip Dan actually starts to go down the wrong side of the road. Ooops! Fortunately there were very few people out so he was able to correct his mistake without wrecking the car or terrifying any of the locals. We arrive at the ferry dock where they line us up with the rest that are crossing today. We’ve got about an hour and a half to kill before boarding so we do the “American” thing. Since it’s pretty cool outside we walk across the street to McDonalds for a cup of coffee. The funny thing is that at McDonalds in this country they don’t just make drip coffee. They actually have baristas making coffee at a special counter. It’s pretty gourmet for this type of joint. Our very limited view of downtown Wellington makes us wish we were going to be spending more time here. There’s lots of things to see here but time just won’t allow it. Before long we must head back to the car and get ready for boarding. Having never been on a car ferry before we’re not quite sure what to expect. Of course, Jilly had her trusty video going so rather than tell you about the ferry ride, we’ll show you. Click on the link at the bottom of this article to view the video. It’s pretty short but will show you the stunning beauty that is Marlborough Sound. The ferry terminal in Wellington. Jilly spread some of her daddy’s ashes here on the way out of the harbor. The ferry ride and Marlborough sound certainly lived up to all the hype. While taking our car on the ferry wasn’t cheap, around $168 NZD/person roundtrip, it was definitely worth every penny. And, although the day was rather chilly and the beginning of the trip was windy with some pretty rough seas we enjoyed every second of it. From Picton we kept on trucking and about six hours later we arrived at Hokitika. Check back to find out more about this artsy, seaside town. CLICK HERE TO WATCH THE COOK STRAIT FERRY CROSSING VIDEO! We were all a bit sad to leave Janet and Theo and the Tutanekai Cottage in Te Kuiti. One day there just wasn’t enough for any of us but we’ve got a lot more miles to cover on this road trip so we were up early and back at it. This was to be a much longer drive than any we’ve done so far. From Te Kuiti to Wellington it is close to a six hour drive. It’s a good thing Dan enjoys driving! Along the way we shared many laughs and enjoyed some stunning scenery. We stopped in one small town and had a quick bite to eat and after that Jack even enjoyed a quick nap in the backseat while Dan drove and Jilly navigated. And if you’re wondering….YES! He does snore! Arriving in Wellington near rush hour was a bit crazy. Wellington has the second largest population of any city in New Zealand at close to a half a million people. Auckland ranks first with 1.5 million. Needless to say there was a lot of traffic and we were all pretty exhausted from the long drive but when we arrived at our house for the night we were all brought back to life by the stunning views. This Air B&B is called the Art Gallery. It has several pieces of artwork hanging on the walls that are for sale but I wouldn’t really call it an art gallery. Most of the pieces are okay at best. But who needs art in a place that has a beautiful balcony and picture window views like this? Yeah, right? This place is something. The inside is clean and it has pretty much everything you’d need. It’s a bit dated but like we keep saying, we aren’t buying it and the views make up for any shortcoming it may have so we’re so happy we chose this place. While we’re a bit rejuvenated by the view we are still tired from the early morning and long drive so Jack, Dan and Jilly head back into town to pick up some Chinese food and we enjoy an evening in. 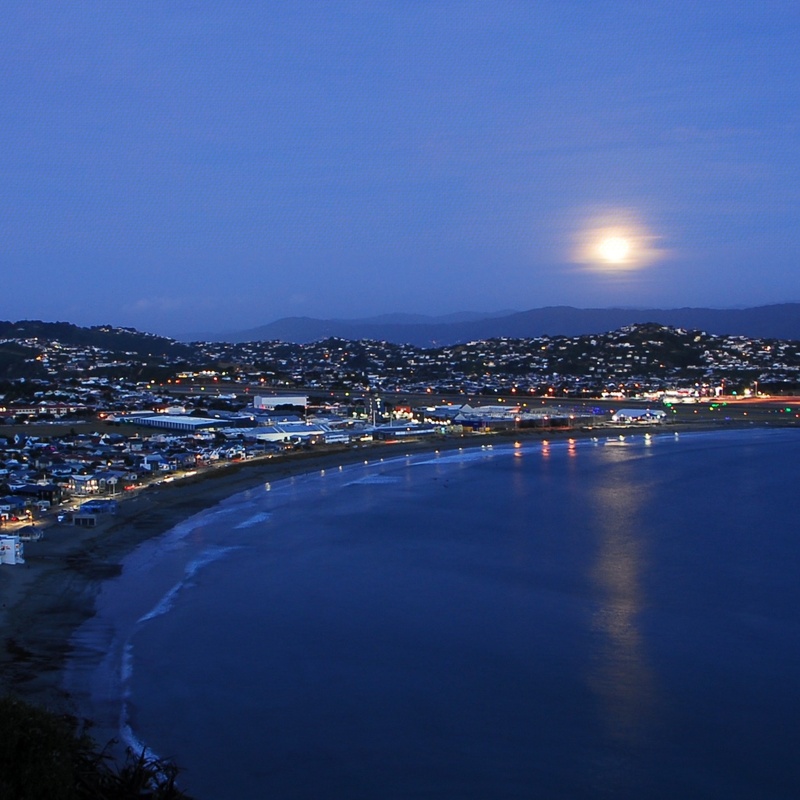 Jilly spends the evening taking photos of the sunset and moonrise over Wellington while the rest of the crew relaxes. Tomorrow will be another very early and very long day. We have to get up early to get to the ferry terminal. 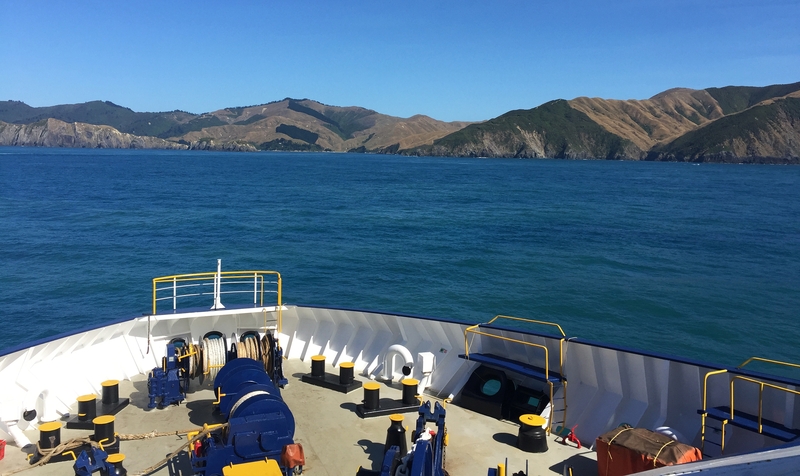 We will be taking the three hour ride from Wellington across Cook Strait and into Marlborough Sound to Picton at the South Island on the Bluebridge Car Ferry. From there we’re driving another five hours south to Hokitika. We can’t wait for the ferry ride. We’ve been told it’s one of the most beautiful ferry rides in the world! Be sure to check back and see what we find along the way.